Professional Performance Certificate candidate Corey Durham has been named a winner of the Symphonic Wind Ensemble’s 2014-15 Concerto Competition. He will play “Three Miniatures” by Anthony Plog with the ensemble in an upcoming performance. 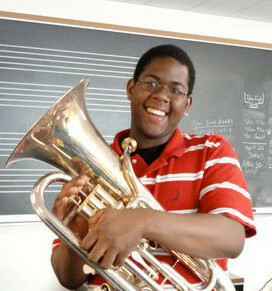 Corey is a tuba student of Velvet Brown. A native of Laurel, Maryland, Corey holds an undergraduate degree in euphonium performance from Penn State and a master’s degree in euphonium and and tuba performance from Baylor University (Texas). He received the Penn State jury recognition award In 2009, and recently placed third in the South Central Regional Tuba Euphonium Quartet Competition. Corey is the son of Michael and Sharon Durham.